You are here: Home / Electric Bike Accessories / The New Xtracycle Edgerunner Electric Cargo Bike, Hooptie, Sidecar, & X2 Bags VIDEOS! The New Xtracycle Edgerunner Electric Cargo Bike, Hooptie, Sidecar, & X2 Bags VIDEOS! Ross Evans, President of Xtracycle, says that cargo bikes and electric assist go together like peanut butter and chocolate. And I totally agree……mmmmmm Reese’s Peanut Butter Cups! Seriously though, I got into the electric bike scene because I wanted to carry extra cargo on my bike and drive less. Xtracycle recently introduced their Edgerunner cargo bike that has the option of coming equipped with a customized eZee electric bike kit. They also have been busy developing new accessories for their cargo carrying systems. They rolled out the their new X2 fully enclosed bag system, the Hooptie child carrying system, and the Sidecar that is literally a sidecar cargo platform for your bike. Ross recently took time to explain all of the new cargo products from Xtracycle in this video series from Interbike 2012. In this video Ross shows off the new Edgerunner cargo bike that uses a 26″ front wheel and a 20″ rear wheel to provide a lower cargo center of gravity. They took the eZee electric bike kit and customized it with some great features: a more powerful motor, the battery is mounted on the seatstays with a unique quick release system, the battery has more capacity compared to typical eZee kit batteries (lithium ion 36V 14ah), it is compatible with numerous light systems, and overall all the connectors are standard connectors so that in the future it will be easy to find replacement e-bike components. The Xtracycle X2 bag system is a fully enclosed and adjustable bag system that is more advanced than the traditional Xtracycle FreeRadical bags. In this video Ross shows off all the cool features of these bags. The Xtracycle Hooptie child carrying system is pretty remarkable! In this video Ross demonstrates all the different ways the Hooptie can be used. The Hooptie can be used for multiple children of different ages, as well as when the children outgrow the Hooptie. 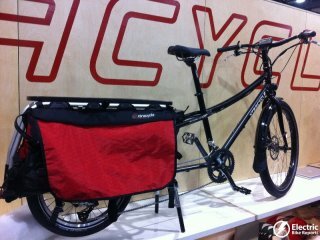 The Xtracycle Sidecar is a great way to carry extra bulky cargo. It even folds up out of the way when not in use. In this video Ross demonstrates how the Sidecar can be used. I hope you enjoyed checking out all of those cargo bike possibilities! An electric assisted cargo bike is a great car alternative. Here is a guide to more electric cargo bikes. Do you have a cargo bike? What do you use it for? Please share your thoughts in the comment section below. I remember Ross mentioning that too, Ken. Good Point. I didn’t feel too comfortable with “plastic gearing” being used either. What’s your take on this, Pete? The plastic planetary gear is in the hub motor itself. It is an extremely hard plastic composite which lasts a very very long time. Such plastic has been used in these hub motors for many years now without ill effect. The gears and gear shifting mechanism are the typical materials – if the hub motor gears were to fail, they are replaceable. And even then, if the gears go kaputz inside the hub motor, the bike can still be pedaled.